Constant Current Laser Driver - Analog Technologies, Inc. 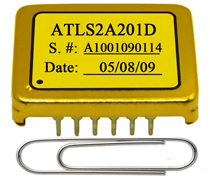 The ATLSxA201D series diode laser drivers are the upgraded drop-in replacements for our CWD-01-V2 laser drivers, with the added benefit of a shorter start up time: 4mS as opposed to 100mS in CWD-01-V2. 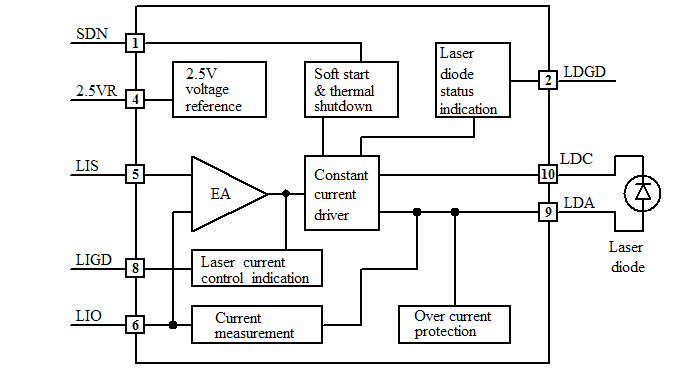 These diode laser drivers are designed for high efficiency when driving laser diodes with low noise constant current. The "xA" in the part number specifies the maximum output current of the modules, which can be: 500mA, 1A, 2A, 3A, 4A and 6A respectively and the maximum output voltage is up to 2.7V when powered by a 3.3V power supply and 4.2V by a 5V power supply. This is the Block Diagram for ATLSxA201D.